My way of dressing up some leftover chicken. Sunday night I roast a chicken. Use a roasting pan and fill the bottom with sliced potatoes, carrots and onion. Fill the pan with water until it reaches half the height of the potato. Sprinkle your favorite chili spice rub on top of the potatoes. Add the rack. Rub the bird with the chili spice rub and cook in a 400F oven until the breast reads 161F. Now that makes for a nice Sunday night dinner! Separate the fat from the roasting liquid and store separately from any leftover chicken and potatoes. Monday, I will chop some kale and fry with salt and cumin seed. Add a a half a cup of the roasting liquid and cover. Cook until the kale is wilted down, about 7-10 minutes. Add the sliced chicken and potatoes to the pan, cover, and cook 2-3 minutes until they are hot. Serve in a bowl. Very yummy! Great post from the archives, 5 ways to Improve Agile Team Velocity. You've heard of a Sloppy Joe so here is my son's version of the classic sandwich. 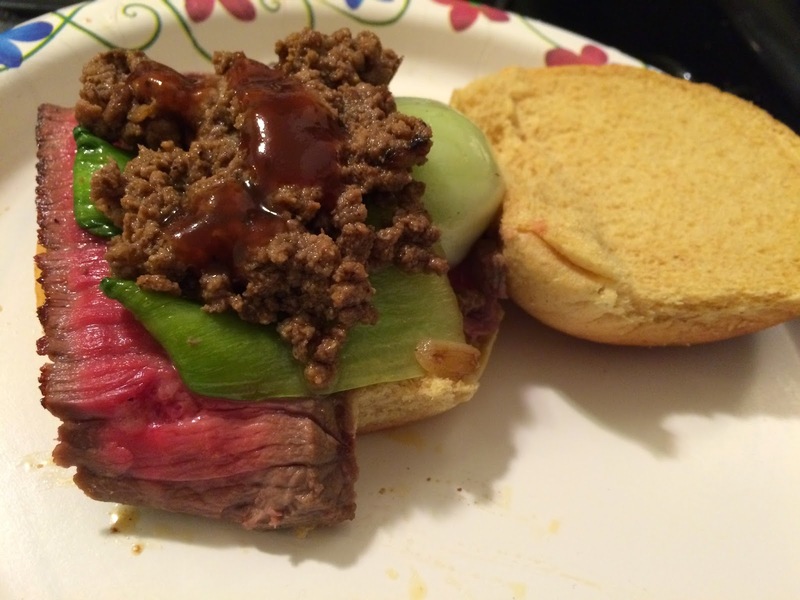 In this sandwich, Ronan has chopped meat sandwiched between a soft bun like the classic, but he adds thin sliced steak for an even meatier flavor and sauteed bok choy for a surprising crunch. The combination of the four textures and flavors makes for a new classic! 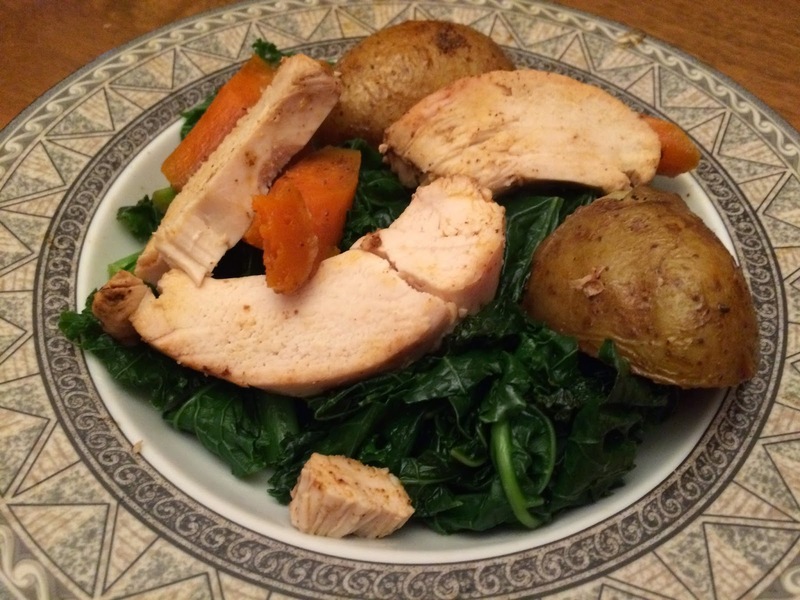 Ronan did most of the prep, cooking, and cleaning so this is a recipe that works great with older chef kids. One touch I added was to show Ronan how to reuse his frying pan to get more flavor and reduce the cleanup. Heat indoor grill pan and set the oven at 350F. Heat oil in a small frying pan. Add onion and saute for a few minutes. Add chopped meat, garlic powder and salt and saute meat until brown. Season a second time with salt and pepper and scoop out into a small bowl. Salt and pepper the steak. Add about a table spoon of oil to the indoor grill pan. It should smoke up, then place the steak on the grill and sear for two minutes on each side. Remove the steak, add it to the frying pan, and place in the oven. Six minutes on a 2.5lb steak will get you a medium-well steak. Remove the frying pan and allow the steak to cool at least ten minutes before slicing very thin. Leave the steak juices in the pan and heat up on the stove. Add the bok choy and saute for about five minutes. To make the sandwich, open the bun. Add a layer of steak followed by a layer of bok choy followed by a spoonful of chopped meat. Drizzle with a bit of the BBQ sauce. Enjoy! Ronan is learning to cook because he enjoys being creative and making new things. It's important for kids to follow their passion and for parents to lead them in their exploration. I provided engineering undergraduate students similar advice in my post, My Advice to Engineering Undergraduate Students.